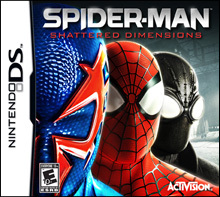 <br>Spider-ManTM: Shattered Dimensions is an action-packed adventure encompassing four dramatically different parallel universes, each with its own Spider-Man armed with unique strengths. Each stunning universe has its own detailed art design and thrilling gameplay with challenging skill sets to master in order to unlock powerful new moves. Explore dramatic, stunning environments, wield explosive new powers, and face epic boss battles against extraordinary foes. Experience the legendary Super Hero like never before: Four unique worlds. Four distinct Spider-Men. One unparalleled experience!Groundbreaking gameplay lets you deal damage in a variety of ways with four unique Spider-Man characters, two of which have been announced:Amazing Spider-Man This most recognizable, acrobatic Spider-Man delivers innovative web combat and dynamic visuals in a world that pays tribute to the classic era of our legendary Super Hero.Spider-Man Noir The cunning and clandestine Spider-Man utilizes the shadows to perform stealth takedowns in this 1930's-influenced black-and-white cinematic environment.